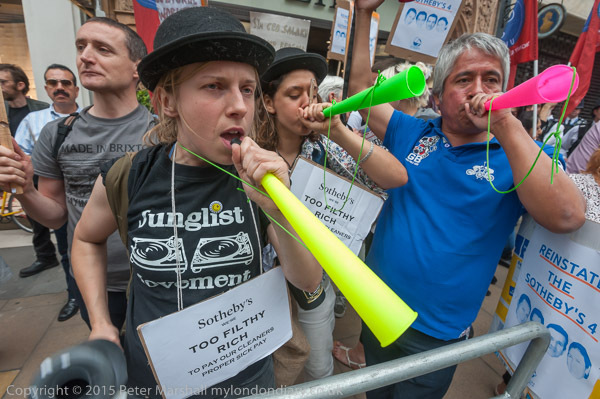 United Voices of the World went back to Sotheby’s intending to have a ‘protest party’ outside while Sotheby’s staff were having their staff party before their summer break inside the building. But the police were not in party mode at all, smarting from being given something of a run-around by the UVW at the previous protest. Of course the union were there for a serious purpose, calling for the re-instatement of four cleaners who had been sacked for protesting outside their workplace calling for proper sick pay, holiday and pension arrangements. The UVW want the Sotheby’s 4 to be re-instated. 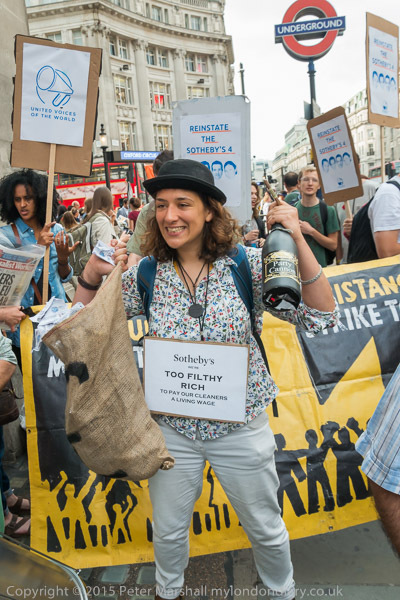 The cleaners are not actually employed by Sotheby’s – so would not in any case have been inside at the staff party. They are employed by a contractor, Servest, but Sotheby’s had refused to let them come into work in the building, effectively sacking them. Had the police behaved sensibly there would have been a noisy but essentially good-natured protest outside the closed frontage of Sotheby’s, causing relatively little disruption to traffic in the area. 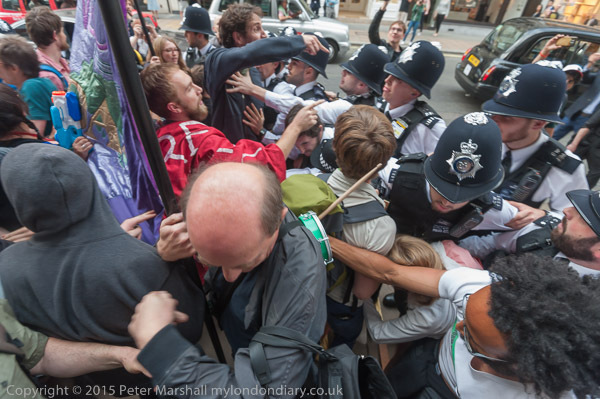 But the police came determined to turn it into a battle and to show the protesters who was boss. As the protesters came up to Sotheby’s they formed a block across the road, closing it to traffic for far longer than was necessary, eventually pushing the protesters off the road onto the opposite side of the street. Later they attempted to stop the protesters from marching around the block, and again there was a lot of pushing and shoving by police, but the protesters walked around them and went around the block, letting off a couple of red smoke flares as they did so. When they arrived back at Sotheby’s police again pushed them off the road and behind the barriers which had been set up to contain the protest. The atmosphere, which had started as good-natured was beginning to turn sour. People don’t like being pushed around by police, and when police again tried to stop them leaving the pen for a second walk around the block things got very heated. The protesters seemed to be pushing their way through when more police joined in, leaving the barriers behind unguarded. People began unhooking them and moving out onto the street and it took a lot more pushing and manhandling of protesters by police to get them back. The police had really lost control, but the protesters weren’t really out to cause trouble – most just wanted an effective and peaceful protest and people just wandered around on the street shouting slogans. Eventually police reinforcements arrived and brought the situation under control. It looked for a while as if they intended to arrest some of the protesters, but they thought better of it – and it was perhaps hard to know what the charges might be. 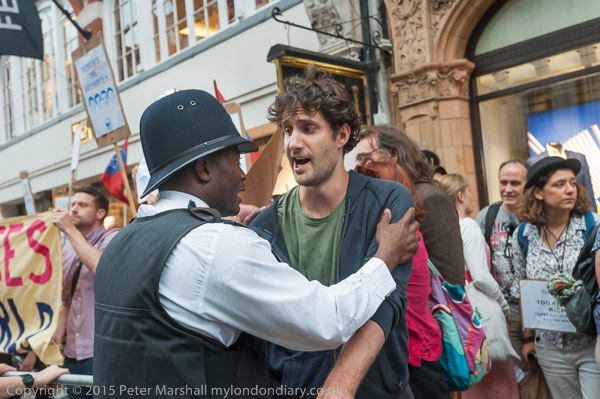 Eventually UVW General Secretary Petros Elia spoke to one of the officers, telling him that they wanted to bring the protest to an end, and he went to see the officer in charge and the protesters were allowed to march away. 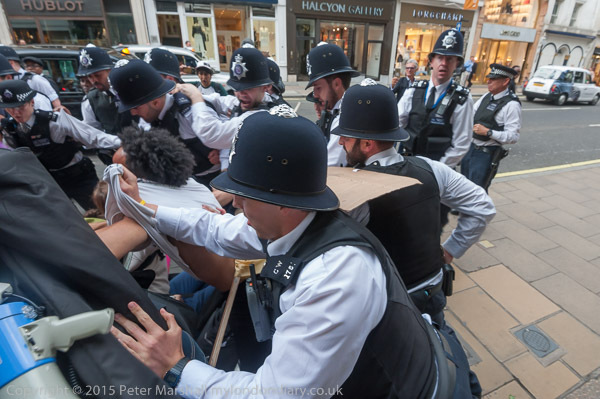 I made my way home, thinking that an essentially peaceful protest had been policed with unnecessary force, and had cost the public several thousand pounds more than had been needed – all because of a little police dented pride. Photographing such events I need to keep a certain distance and objectivity, which can often be difficult. I also try hard to avoid getting in the way of the police in the discharge of their duty. 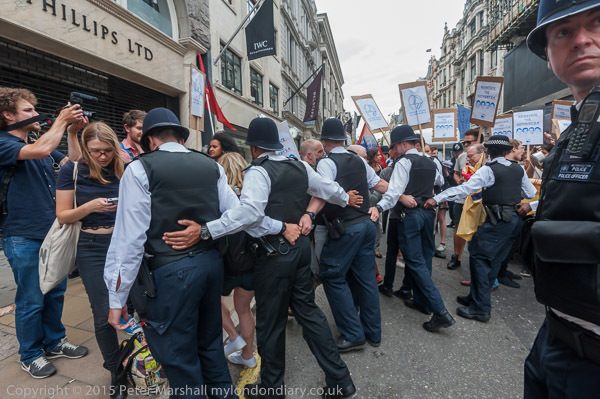 Often police don’t want to be photographed and can be unnecessarily obstructive – and I was asked to move back on a couple of occasions during this protest when I felt it was entirely unnecessary – and also got pushed out of the way rather roughly. 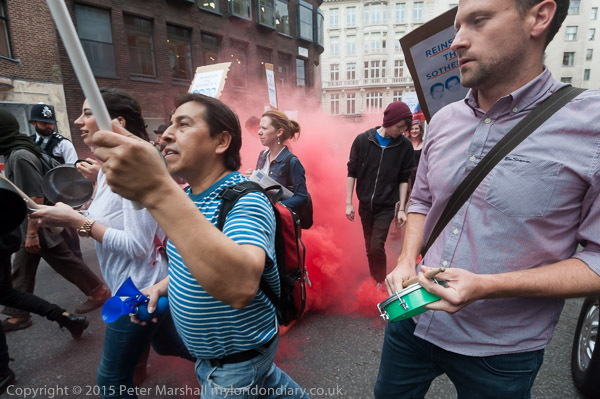 Annoyingly police often ask photographers and protesters to move ‘for your own safety’ when its clear we are in no way at risk. More at Reinstate the Sotheby’s 4. This entry was posted on Tuesday, November 10th, 2015 at 10:50 am and is filed under My Own Work, Photo Issues, Political Issues. You can follow any responses to this entry through the RSS 2.0 feed. You can leave a response, or trackback from your own site.